Ever felt like running out of Temple on Rosh Hashana or Yom Kippur? If you did, would your Rabbis chase you down? This is one man’s story of Temple fear. In 1954, before his senior year of high school, Wilt Chamberlain took a summer job that would change his life. He worked as a bellhop at Kutshers Country Club, a Jewish resort in the Catskill Mountains. By day he was making 2 dollars an hour and getting great tips from the awestruck guests as he lifted their luggage through a second floor window while standing outside on the ground. 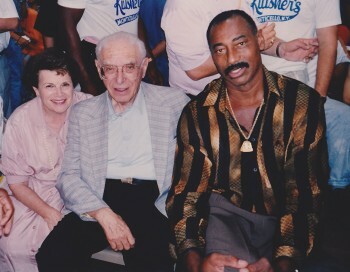 At night, he played on the Kutshers basketball team and was coached hard by the resorts athletic director, the soon-to-be legendary Red Auerbach. Mixing rarely-seen archival video and interviews with people who lived and worked with Wilt during that magical summer, this documentary short reveals an unexplored and pivotal chapter in the life of one of basketballs greatest players, and a fascinating glimpse of a time when a very different era of basketball met the Borscht Belt in its heyday. At THIS Bar Mitzvah – Sam is really The Man! How would you like a little Jeniffer Lopez at your Bar Mitzvah? Sam Horowitz ushered in his new Bar Mitzvah status on a stage of shiksas in Dallas. Would you do this for your son if you had the challah? The Ukrainian Jewish community may call it “the Shiksa race” but non-gentiles around the world love watching. If you plan on joining the race, just don’t tell bubby. Funnyman Seth MacFarlane was replaced as host of the Oscars due to anti-Semitic jokes, according to The Forward. What are your thoughts? Was it the right thing to replace the edgy gentile for the safer gentile? Should they have over compensated and gave the hosting gig to Woody Allen or Larry David? Can gentiles make edgy Jewish jokes? LOS ANGELES – Comedian Ellen DeGeneres has been chosen to host the annual Oscars telecast in March, after last year’s host and “Family Guy” creator Seth MacFarlane got into hot water over jokes about Jews in Hollywood and provocative dance routines. This would be her second stint as master of ceremonies for the Oscars. DeGeneres, the star of her own daytime talk show “Ellen,” previously hosted the Academy Awards, the film industry’s highest honors, in 2007. DeGeneres, 55, earned an Emmy nomination for her performance in 2007 in which she departed from traditional Oscar hosting decorum and ventured into the audience for spot gags, at one point handing director Martin Scorsese a script of her own. Whoopi Goldberg and DeGeneres are the only women to have served as solo hosts of the Oscars. Goldberg has hosted the Oscars four times, most recently in 2002. Disney-owned ABC will broadcast the Oscars on March 2. More Flack: Seth MacFarlane, left, and Alex Borstein perform during a Fox show. In the special, part of a Fox night of programming celebrating MacFarlane with multiple “Family Guy” episodes, the screenwriter’s Jewish co-star, Alex Borstein, (who, like MacFarlane, voices a character on the animated series), protests his singing “Edelweiss” from “The Sound of Music,” a tribute to Austria. MacFarlane tells Borstein that the television show is not the place to bring out her “Hebrew baggage.” Still arguing, Borstein reveals that her mother and grandmother “barely escaped” the Nazis. In response, MacFarlane implies that if World War II were never to have occurred, Borstein would have more competition in Hollywood from Jewish female comedians. “Right now, it’s just you and Sarah Silverman,” he says. Defeated, Borstein joins MacFarlane in song. Questions regarding MacFarlane’s humor about Jews have long circulated. In 2000, he penned a “Family Guy” episode titled “Once Upon a Weinstein.” The show’s Catholic protagonist, Peter, happens upon a Jewish man, and the encounter leads him to conclude that converting his dim-witted son, Chris, to Judaism will increase the boy’s intelligence. Father and son race off to Las Vegas for an instant bar mitzvah, prevented only by the family matriarch, Lois. Due to its controversial content, the episode did not air for several years. In October, the Forward reported that Fox took flack for airing an episode titled “Family Goy,” in which Lois discovers her mother is Jewish. The episode was laden with stereotypes.